When she was growing up in Nigeria and thinking about her future, Titilola Harley knew she wanted to help people. She also knew she wanted to wear a suit to work every day like her mother did, but she didn’t have a specific job in mind that would merge these two things. In fact, many of Titilola’s choices have been serendipitous – from pursuing her undergraduate education in the US and getting an MBA (both at the George Washington University) to working in education at DC Public Schools and later launching her own consulting firm. Through the years, she has not only supported girls’ empowerment, she has taken action as a mentor and leader of a weekly class for elementary age girls. 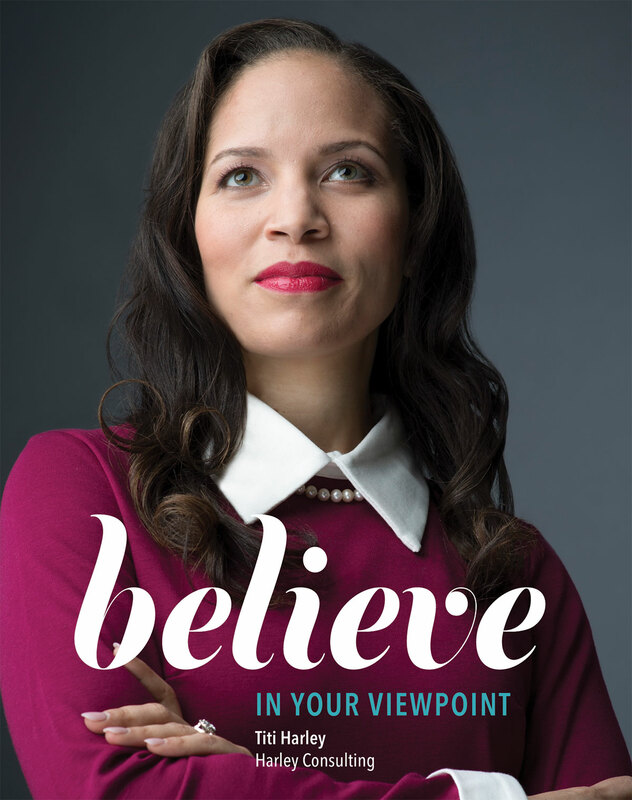 Titilola believes that although life cannot always be planned or scripted – and there will likely be a few bumps along the way – faith can propel us to make our own success and find meaning in each of our experiences. My father is British and my mother is Nigerian, so I am half British/half Nigerian. I was born and raised in Nigeria and – as a result of attending American, international schools – I chose to pursue my college education in America. Having a multicultural background and being an immigrant to the US certainly shapes how I approach life and work. People joke about immigrants being this way, but it’s true: you’re instilled with the concept of hard work and excellence, and failure isn’t an option. In high school, I held a lot of student government and leadership positions, which was the beginning of the path to going to business school and becoming an executive. When I decided to study in America, I had no point of reference except a trip to Disney World in Florida at the age of nine. My parents were supportive of my decision to apply to colleges in the US, but I had to figure out the application process on my own. Once I arrived in America, I realized quickly that I had to adjust and adapt. Because I went to international schools with people from different backgrounds, I understood that culture matters, and I learned early on how important it is to be able to interact with people from all over. This is especially true as a consultant. For example, I once had a project in South Carolina, and I learned quickly that working with people there is different than working with people from New York. In South Carolina, I experienced that you generally don’t just start a meeting. You allocate a few minutes to personal conversation because otherwise, it feels very abrupt to jump right into the business. To develop trust, you can’t just steamroll in and assume the way you typically handle things is the only, right way. The George Washington University (GW) has a prestigious program for graduating seniors – the Presidential Administrative Fellowship – that allows them to get a free graduate degree while getting work experience at the university. Students who have made an impact in their communities and demonstrated leadership qualities are selected and, as Fellows, their skills and perspectives are leveraged to advance GW initiatives in various ways. For example, when the University president wants to understand what’s going on with students, a Fellow might be asked to provide insight as a former undergraduate and current graduate student. It’s sort of an Ambassador program. I was accepted as a Presidential Administrative Fellow and was able to pursue a full-time MBA, while also taking on all these other responsibilities. It was really difficult being a full-time student at the same time, but it taught me a lot about time management and enabled me to get a free MBA from a fantastic school. The downside – and I want people to know this – is that the MBA is not the type of degree that you will benefit from straight out of undergrad in the same way as someone who has gained some kind of life and work experience after college. You need to know what it’s like in a full-time working environment for at least a couple of years to know what you want to get from your MBA. In my first year, I focused in areas where I thought I would do well versus where I would actually stretch myself, and I didn’t have the benefit of life to teach me where I needed to grow. Don’t turn down a free MBA, but if you have the option, I recommend waiting. For a long time, I questioned my credibility as a consultant, and I Iacked confidence because I was young, I was a woman, and I did not have a lot of work experience. I have seen enough now to know that I have something to offer, and everyone else does, too. You have a unique perspective that nobody else can replicate so be confident that you’re bringing something that others cannot. At a board retreat the next month, the chair of the board pulled me aside and said, “You were selected in a competitive process, and we chose you for the insight you bring. Don’t feel like you should not speak up. You have a voice.” It was so empowering for someone to intuit how I was feeling and give me this advice. Without fail, whenever I spoke up after that, people would listen because they didn’t know what it was like to be an undergrad student at GW, an alum of the university, and an international student. They had no concept of those things, and I realized that if I didn’t speak up, nobody else could. That’s when I learned that what you bring to the table is unique and you have credibility in that, so use your voice. I could not, at that point, pledge two million dollars, but that’s not why they picked me. They were looking for me to do what I did. 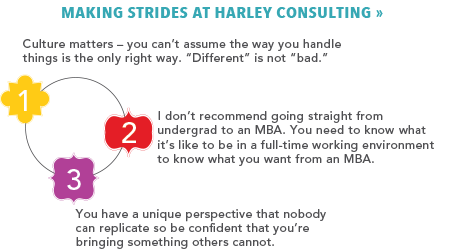 When I was getting my MBA, I liked the idea of consulting because of the variety it offers. I am not a US citizen, and none of the big consulting firms in DC would even consider me for an internship or job because I couldn’t get a federal clearance as a non-citizen. It was really demoralizing. I started to think, “Maybe I’m not good enough” and considered writing consulting off as an option. When I graduated in 2009, it was also the depth of the recession. It was a really scary time, but fortunately I was able to stay on at the job I had at GW while I was job searching. I was job searching via informational interviews, and I started reaching out to people I met who were guest speakers for GW events. I met the head of Human Resources at DC Public Schools (DCPS). I loved education so I thought I would ask for information and learn about DCPS. After the meeting, as we were leaving in the elevator, she casually introduced me to one of her colleagues. I got a call a week later and was invited to an interview for a position in the Office of Special Education that I had not applied for or even known about. I got the job as a business analyst, and I ended up working with a bunch of consultants in the education sector. My work and work ethic caught the eye of one of them who ended up offering me a job at their consulting firm. The DCPS job was not one that I needed an MBA to get – it was an analyst job. Beggars couldn’t be choosers at the time, and I was interested in education. Colleagues at the consulting firm told me, “You worked as if this job was the most important job there was, and you demonstrated such a level of commitment that we thought, ‘Here is somebody that we want on our team.’” I ended up working there for seven years. I launched my business a few years ago and have picked up clients very slowly as I was working full-time for the consulting firm until recently. My husband and I – along with another couple – also started a real estate investment and development firm, The Harbane Company, and it has taken off. What holds entrepreneurs back is fear. Having my son last year made me realize that I need to be the captain of my own fate. Harley Consulting Group is a management consulting firm, and our vision is to walk alongside our clients to tackle real problems, make real change, and achieve real success. Two of our current projects are in education, but through my career I have come to realize that organizations are made up of people, and people have very similar problems, regardless of the industry. We just did a project with a hospital. I don’t have a lot of healthcare expertise, but I do have a lot of expertise around strategic planning and stakeholder facilitation which allowed me to address a need they had. Princess of the Throne is a girls’ empowerment program at my church. I facilitate a weekly, two-hour class of 10- and 11-year-old girls to teach them life skills and help empower them to speak up for themselves and know their worth. You can try to orchestrate things, but they will eventually work out the way they need to. When I tried to pursue consulting initially, every door shut in my face. Now I am not only doing consulting, but I’m doing it in an area I care about with my own firm. Do Something by Kevin Young. It’s a Christian book, and its message is to take a step of faith. You don’t know how things are going to work out, we learn from mistakes, you can’t tell the future, but you need to take that first step. Early in my position at DCPS, I wanted to make a good impression. I showed my boss a compelling piece of data. Without my knowledge, she took it to the deputy chancellor and a memo went out to all the DC schools. Later we learned I had misinterpreted the data so I had to redo it. It taught me a lot about checking everything twice and being absolutely sure of information before sending it to someone else. 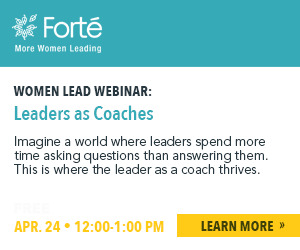 Get more inspiring stories and a wide array of professional development programs to help you attain the career you deserve by joining Forté.